Lake Eola Fountain to the east of Downtown Orlando. Photo taken February 18, 2008. 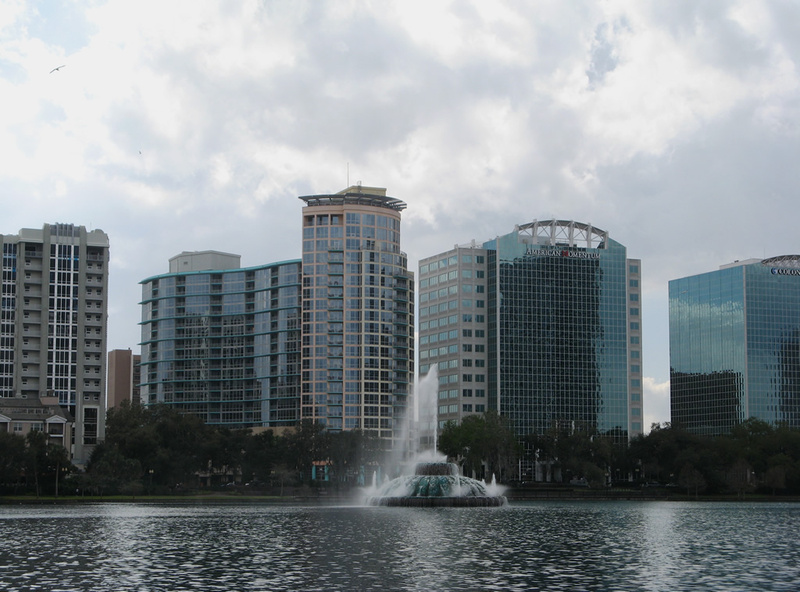 Much of the Orlando economy is based upon tourism and the major theme parks that call the area home. These include Walt Disney World, Universal Orlando, Sea World, etc. Additionally International Drive and the area Convention Centers bring a bounty of visitors to the area along with the tropical type climate that appeals to winter snowbirds. Before 1950, Orlando was not much different from other wintering locations along the Dixie Highway including Sanford, Winter Park, DeLand. Expansion of the military operations at McCoy and PineCastle Air Force Bases in conjunction with a missile program based in Orlando began the inexorable growth that continues today. As the military presence and role in the local economy decreased, tourism starting with the opening of Walt Disney World in southwest Orange County, took over as the main conduit of money making in central Florida. This trend continues today with tens of thousands of new homes continuing to be added to the metro. During the early part of the settlement of Florida, most development took place in the Northern part of the state. The peninsula remained an untamed land populated by Indians, swampland, and alligators. The first settlers filtered in from the north, and settled areas around Tampa Bay and Cape Canaveral. With the coming on the railroads in the mid-19th century, the population increased and agriculture was the main industry. Railroads carried tropical goods from ports like Tampa north. Most of the roads built in the 1800s were for getting goods from inland agricultural regions to these ports and railroads. Other roads were built in response to threats from Indians. Mule trails followed older Indian trails between the forts built by the military to combat Indians. Interstate 4 follows such a trail from Sanford to Tampa. Serious development and population growth did not occur until the first 30 years of the 20th century. Developers began purchasing land and building model communities, suited towards retiring northerners and tourists alike. Florida soon realized that its prosperity would be tied directly to its transportation facilities and was one of the earlier parts of the country to begin developing road networks on a large scale. The most important road in this early development phase was the Dixie Highway, which connected Florida to the Midwestern US. In Florida, the Dixie Highway was 9 feet wide and paved almost entirely with bricks, a substantial engineering feat at the time. At about the same time, the new US Highway system provided good road connections with the peninsula to the rest of the country. US 27 followed the hilly, central spine of the state, US 1 followed the eastern shore, and US 17 followed an old military road connecting forts. The road system was considered adequate until after WW2, when the boom in population and increased tourism required a new type of road. Something limited access, paved, and high speed to get tourists south as quickly as possible. In order to accommodate these needs, the Florida’s Turnpike Authority was created in 1953. The first segment of the turnpike was built in 1957 along a route from Miami to Fort Pierce. The first portion of the route was agreed upon by nearly everyone, but the second part of the road created controversy. It was generally thought that the second portion of the turnpike would continue eastward up the coast to Titusville, Daytona, and Jacksonville. However, Orlando area civic leaders Billy Dial and Martin Andersen used their positions (Dial was on the state road board) to have the turnpike routed westward. Some east coast residents were also worried a turnpike up the coast would compete with US 1. This sentiment continued into the 1970s and delayed the completion of parts of I-95. The turnpike would continue through Orlando to end at a virtually unknown locale called Wildwood. The second portion of the turnpike was completed in 1964, it would not be until later that year when the turnpike was connected to I-75. Central Florida saw another boom with the construction of the Kennedy Space Center in the 1960s, and with it new population and traffic concerns. To address these, the Orlando Expressway Authority was created in 1963. The organization would administer the new expressways in the area, to be financed by tolls. The first regional toll road, the Beeline Expressway, opened in 1967 and connected Interstate 4 with Cape Canaveral. Interstate 4, originally planned in 1956, was built to connect Daytona Beach and Tampa, and would provide a quick way for travelers heading to the west coast of Florida from the Northern US. Although a short road by interstate standards, I-4 is much more important to Florida than its length would imply. For it was during the construction of the I-4/Turnpike Interchange in 1964 that Walt Disney flew over in his Beechcraft and exclaimed “this is it!”. The construction of Disney World in the 1960’s provided a catalyst for central Florida that resulted in massive population and tourism growth. Many thanks to Justin Cozart for the background information about Central Florida. This information was originally posted on TropicalTurnpikes.com and is reproduced with permission by Justin Cozart. Interstate 4 travels generally north-south through the Orlando metropolitan area, providing the only untolled freeway for area residents, tourists and through traffic. The busy freeway serves the resort areas including Walt Disney World, Universal Orlando and Sea World from the Osceola County line northward into Orlando. This stretch stays busy well into the night time hours. Further north, I-4 passes just west of the Orlando central business district. The winding stretch north from Downtown Orlando sees variable speed limits that default to 50 miles per hour during normal traffic conditions. Beyond Orlando, I-4 continues to Winter Park and Eatonville to enter Seminole County through the suburban cities of Altamonte Springs and the county seat of Sanford. I-4 exits Seminole across western fringes of Lake Monroe for DeBary, DeLand and Deltona. Interstate 4 was completed in 1965 through Orlando. Beltway plans soon followed, gaining momentum as Interstate 4 became more and more congested in the mid-1970s and mid-1980s when the metro population surpassed 1,000,000.2 Overall the freeway carries six lanes with some sections as wide as eight lanes with the addition of auxiliary lanes. A plan to add HOT lanes (Express 400) for Interstate 4 through the Orlando area was touted around 2000 but never built. Those plans were replaced with the I-4 Ultimate Project. Totaling $2.3 billion and stretching 21 miles from south of Florida 435 (Exit 75) to north of Florida 434 (Exit 94), this work adds four express toll lanes along the median of Interstate 4 and includes the reconstruction of 15 interchanges. Construction runs between early 2015 and 2021. Florida’s Turnpike opened from south Orlando to Yeehaw Junction (SR 60) in Osceola County on July 17, 1963 and northward to I-75 in Sumter County on July 24, 1964. The toll road provides a long distance route north to Ocala and Gainesville and south to Fort Lauderdale and Miami. The Turnpike mainline runs 312 miles overall, angling southeast from Wildwood to Oakland, Winter Garden Ocoee and Southwest Orlando to exit Orange County via Kissimmee and St. Cloud. In addition to the Sunpass electronic tolling, a ticketed system for cash-paying drivers remains in use along the Turnpike south of St. Cloud to Exit 47. Ramp tolls and a mainline plaza in Lake County collect tolls from motorists northward. 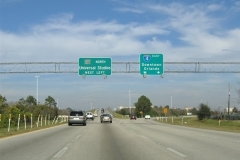 The turnpike doubles as a commuter route through Orlando, and because of the added traffic load, portions of SR 91 were widened. This includes the March 2008 completed eight-lane expansion project between SR 528 and Interstate 4 and a 13-lane portion between the Western Beltway stack interchange and SR 408 west end completed by November 2010. Florida 408 was constructed originally as a bypass to the congested Florida 50 (Colonial Drive) through the city of Orlando. Extensions were later added in the west and eastbound directions as growth expanded Orlando outward. The most recent extension ties the East West Expressway with Florida’s Turnpike at Ocoee. Further extension of the road is being studied for both ends. Toll plazas along the East West Expressway were converted from conventional cash collection to include open road tolling lanes through the mid-2000s. This included the replacement of the Holland East Main Toll Plaza with split plazas (Conway East and Conway West) completed in September 2009. Other projects undertaken between 2003 and 2013 widened Florida 408 and reconfigured several interchanges from Florida’s Turnpike east to Chickasaw Trail. This includes ten-lane portions. A prior east end of SR 408 tied the East West Expressway into the Central Florida Greeneway (Florida 417). When SR 408 was extended east, the curved portion to SR 417 was renumbered as SR 4080, an unsigned designation. The former SR 408 mainline provided movements from east to north and south to west between the two toll roads. Work completed between October 2010 and late 2012 added direct flyovers between SR 408 and SR 417, eliminating the need for SR 4080. The former East-West Expressway mainline, including the diamond interchange with Valencia College Lane, was removed upon completion of the new ramps to the east. The right of way was repurposed for a new at-grade frontage road leading southwest from Valencia College Lane to the Chickasaw Trail half-diamond interchange (Exit 17). Florida 414 is a 15.84-mile route traveling east from Apopka to Maitland. 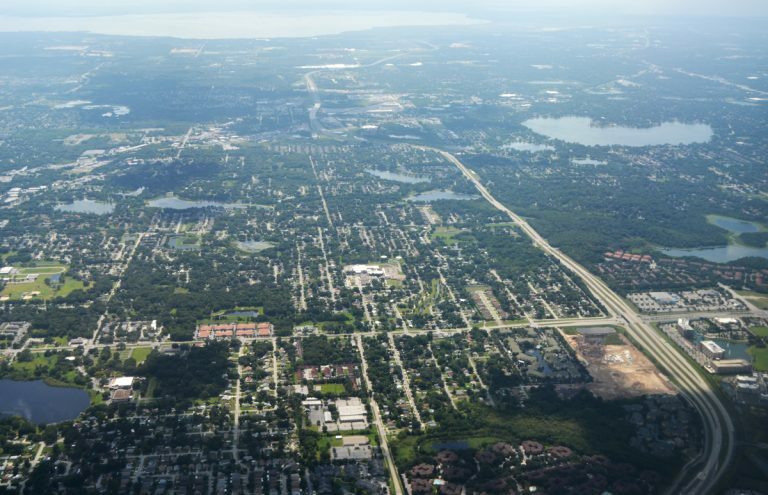 The state road follows the tolled John Land Apopka Expressway to the west of U.S. 441 (OBT) and Maitland Boulevard, a controlled-access arterial route to the east of OBT. Maitland Boulevard varies between four and six lanes with access restricted to at-grade intersections and three interchanges. Sound barriers line the arterial west of I-4. The single point urban interchange (SPUI) with SR 434 (Forest City Road) opened in the mid-2000s. Florida 414 extends west from a parclo interchange with U.S. 441 (OBT), south of Forest City to OBT west of Apopka The toll road initially opened west from OBT to Ocoee Apopka Road (CR 437A) on May 15, 2009. Work followed to realign Daniel Webster Western Beltway (SR 429) westward to a new alignment tieing into SR 414 west of CR 437A. A tri-level stack interchange was constructed where SR 429 originally paralleled Ocoee Apopka Road. The flyover from the Western Beltway south to Apopka Expressway east opened on March 15, 2012. 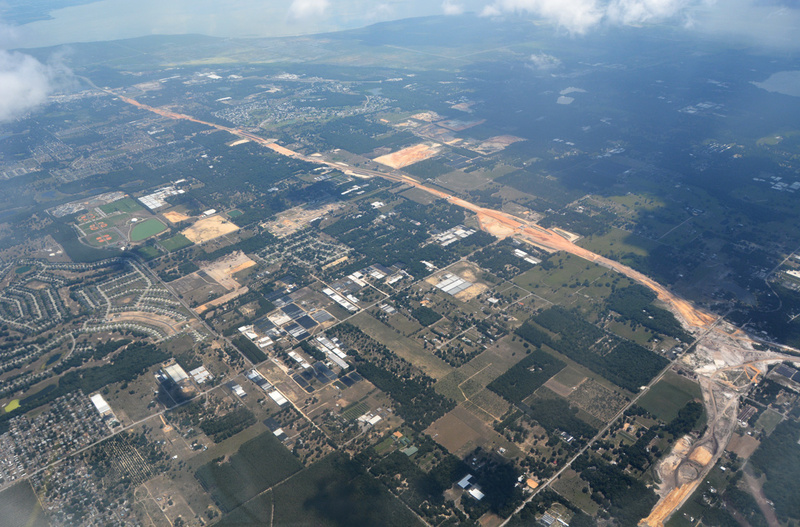 Completion of the John Land Apopka Expressway (SR 414) followed on January 19, 2013. This portion doubles as the SR 429 mainline leading north to the future Wekiva Parkway north to Mt. Dora and Sanford. The toll road ends at a half-built SPUI with an access road linking OBT and CR 437 (Plymouth Sorrento Road). The southeastern beltway opened in 1990 at a cost of $72 million between SR 408 and SR 528. Curvature along this stretch resulted from land developers pushing to accommodate future growth.1 The Lee Vista Boulevard interchange (Exit 27) did not open until 2000. Issues arose with skyrocketing costs associated with land acquisition in the Sanford area for the final portion of SR 417. This led to Congressman John Mica making a deal to land federal money to secure building of the northernmost segment of Florida 417. Opened in 2002, the five-mile Missing Link was completed at a cost of $265 million. The mid-1990s also saw the cancellation of the Wekiva Parkway segment of Florida 429 due to rising costs. As originally envisioned, the SR 429 portion of the beltway would tie in with the SR 417 north end, with an interchange modification costing upwards of $100 million.1 With the Wekiva Parkway moving forward in 2012, future work will add a flyover from SR 417 north to I-4 west as part of the interchange upgrade slated for 2019. State Road 429 forms the western half of the tolled Orlando beltway system. The Daniel Webster Western Beltway portion serves outer reaches of the Orlando metropolitan area northward from Interstate 4 in Osceola County to Walt Disney World and Horizon West. The beltway continues north through Winter Garden and Ocoee around the east side of Lake Apopka to U.S. 441 (Orange Blossom Trail) in the city of Apopka. 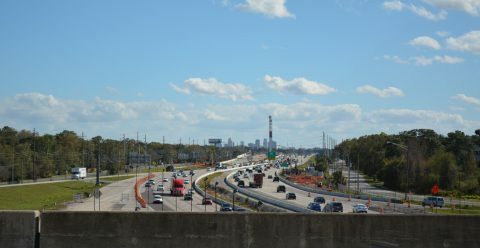 Wekiva Parkway, initially estimated to cost $1.2 billion, will complete the Orlando beltway system between Apopka and Sanford. Canceled in 1994 and revived in 2003,2 design work on the 25-mile toll road commenced in 2012. 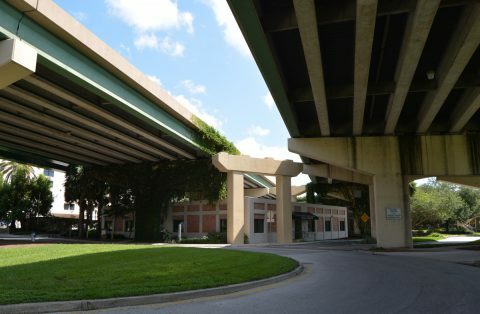 Landowners, officials, and environmentalists compromised with the Wekiva Parkway legislation, requiring land preservation and building an elevated road with few interchanges.1 A cooperative effort between the Central Florida Expressway Authority, Florida Department of Transportation (FDOT) and Florida’s Turnpike Enterprise constructs the toll road at a cost of $1.6-billion. Construction kicking off in 2015 extended SR 429 five miles north along Wekiva Parkway to Kelly Park Road. Partitioned between Sections 1A and 1B, the CFX project wrapped up with a ribbon cutting ceremony held on the morning of July 27, 2017. Work on Sections 2B and 2A, taking SR 429 northeast to CR 435 near the Lake County line, concluded on March 31, 2018 with a grand opening ceremony. This stretch includes a three-wye interchange with SR 453, the Mount Dora Connector (Section 2C). SR 453 opened on March 31, 2018 as well. The first section of the Wekiva Parkway officially opened to traffic on January 20, 2016. Constructed by the FTE, Sections 4A and 4B link Orange County 435 (Mount Plymouth Road) and State Road 46 in southern Lake County. FTE will build the remainder of SR 429 east, including sections 6, 7A, 7B and 8. The 25-mile toll road will overtake the SR 46 corridor east into Seminole County, with the final section angling southeast directly to the interchange joining I-4 and SR 417 (Seminole Expressway). Completion is expected in 2021. Construction of the John Land Apopka Expressway (SR 414) around the south and west sides of Apopka included the realignment of SR 429 away from the Daniel Webster Western Beltway to accommodate the future Wekiva Parkway north to Lake County. Opened on January 19, 2013, the 3.7-mile portion west of Apopka redirected SR 429 north along side SR 414 west to a temporary end at U.S. 441 (Orange Blossom Trail). The former SR 429 mainline along the Webster Beltway to U.S. 441 west of Downtown Apopka was redesignated as SR 451. A 0.85-mile extension of SR 451 ties the north end of the Daniel Webster Western Beltway with Vick Road at Old Dixie Way. The $2.2-million project4 was completed in August 2013. SR 453 is the Mount Dora Connector, a three mile toll road spurring northwest from Wekiva Parkway (SR 429) to SR 46, east of Round Lake Road. A trumpet interchange connects the west end of the expressway with SR 46 between Mt. Dora and Sorrento. Eastward, a systems interchange joins SR 453 with SR 429 just south of the Orange County line. An AET gantry collects tolls in each direction. The toll road opened to traffic by 2 PM on March 31, 2018, along with Wekiva Parkway south to Kelly Park Road and east to SR 46 at Mount Plymouth. Formerly the Bee Line Expressway, the 41-mile long Martin Andersen Beachline Expressway joins Interstate 4 and Orlando with Cocoa and the Space Coast. Construction on SR 528 began in early 1966, with the expressway mainline opened July 14, 1967. It tied into an upgraded Sand Lake Road west from near Orlando International Airport (MCO) to Interstate 4 and east to Florida 520. U.S. 441 doubles as Orange Blossom Trail from Lake County southward to Main Street in Kissimmee. Between U.S. 192 (Vine Street) in Kissimmee and Florida 50 (West Colonial Drive) in Orlando, U.S. 441 shares pavement with U.S. 17 & 92. Orange Blossom Trail is often abbreviated as OBT when referenced by area residents and media. Much of OBT consists of busy commercial arterial, especially from the city of Orlando southward to Hunters Creek and the Osceola County seat. Northwest from Orlando, the route varies with commercial and industrial frontage through Fairvilla and Lockhart to Apopka. Once in Apopka, U.S. 441 bisects Downtown on the western push toward Mt. Dora and Eustis in Lake County. All of the route carries at least four lanes, with six lane portions around Mount Dora in Lake County and through southern Orange and northern Osceola Counties. OBT generally serves as a local or commuter route throughout the Orlando metropolitan area. Bypassed by the John Land Apopka Expressway (SR 414) when it was completed in 2013, further through traffic will leave U.S. 441 when Wekiva Parkway (SR 429) opens northward to Mt. Dora with SR 453. Florida 50 follows Colonial Drive throughout greater Orlando. The state road links the city with Ocoee, Winter Garden, Oakland, Clermont and Minneola in Lake County to the west. 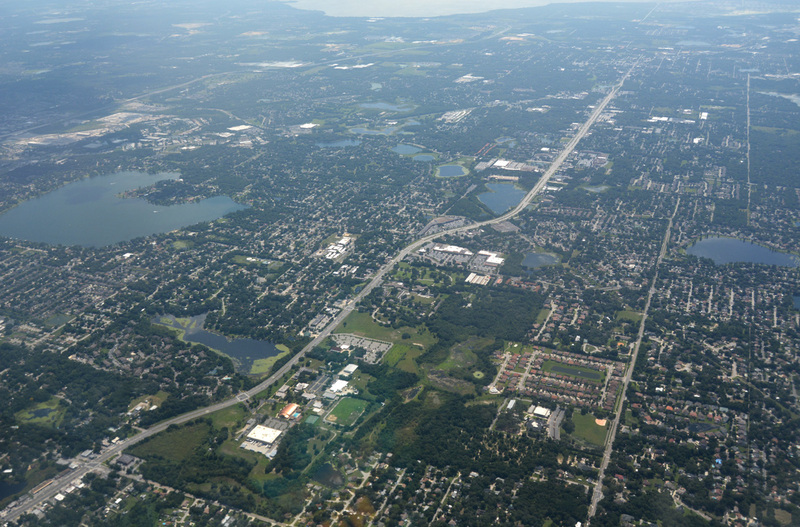 East of City Beautiful, SR 50 connects Orlando with unincorporated sections of Orange County including Union Park, Bithlo, and Christmas ahead of Titusville and the Space Coast. The entire alignment of Florida 50 carries at least four lanes, with some sections expanded to six lanes. Much of Florida 50 is at-grade, though a single point urban interchange (SPUI) opened with Florida 436 (Semoran Boulevard) by March 2010. The state road bisects the city, including a busy stretch to the north of Downtown. As such, traffic issues along the route during the 1950s and 60s led to development of the East-West Expressway, and its eventual extensions, to provide relief. U.S. 17 & 92 overlaps with SR 50 (Colonial Drive) between Orange Blossom Trail and Orlando Avenue. Streets and arterials in and around the Orlando metropolitan area in Central Florida. “Expressway Authority Announces Opening of New Moss Park Interchange Ramp.” Orlando-Orange County Expressway Authority (OOCEA), press release. December 3, 2009. “Apopka will get quicker connection to 429 with Vick Road project.” Orlando Sentinel, October 10, 2012. “Building a Community – The History of the Orlando-Orange County Expressway Authority.” Shofner, Dr. Jerrell H., Orlando-Orange County Expressway Authority. Page Updated August 20, 2018.